Jehovah (Yahweh) of old walked in Eden and held communion with Adam. He visited the patriarchs, the fathers of the nation, but He never had a home on earth until the Tabernacle was erected in the midst of His redeemed people. (1) What is a Tabernacle? The Tabernacle was the Place of the Divine Presence. When the tabernacle was finished, the glory of Jehovah so filled the sacred enclosure that Moses, the mediator, could not enter (Exodus 40:35). (2) Why was the Tabernacle built? The Tabernacle was to meet a Divine Purpose. Moses didn’t build a tabernacle and then invite God to come into it. Instead, it was God who conceived the plan and instructed Moses on how it was to be built, for He desired to dwell among His redeemed and chosen people. (3) How was the Tabernacle constructed? 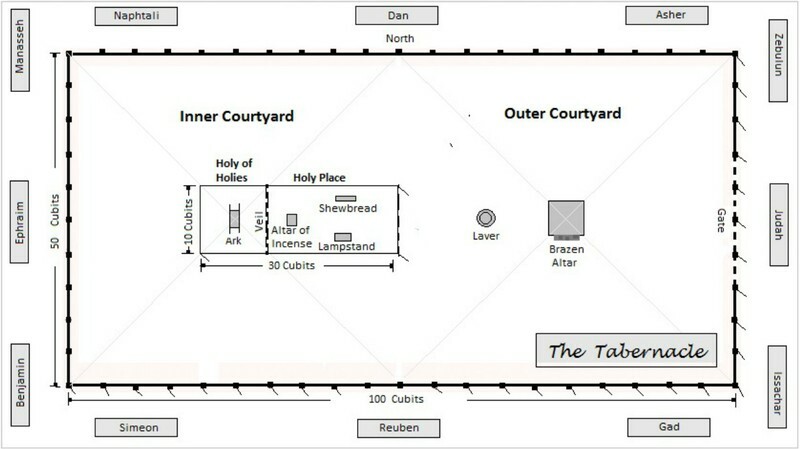 The Tabernacle was constructed according to a Divine Pattern. “Look that thou make them after the pattern which was showed thee on the mount,” (See Exodus 25:40). It was because these things had a spiritual meaning that they were to be made according to a heavenly pattern. Encircled by a wall of righteousness. What was dreaded on the outside gives peace on the inside. Supported by a foundation of divine justice. Brass sockets and pins indicating that sin had been righteously judged. Protected by the unbroken line of redemption (silver chapters, fillers, and hooks made from the redemption silver). Privileged to assemble with God’s people and to listen to the announcements of God’s word. The Place of the Altar - The place of the altar relative to the other pieces of furniture teaches us that God comes out from the mercy-seat by way of the Table of showbread, the Golden Lamp stand, and out to the brazen altar. This is a display of the grace of God when God acts in His Sovereignty and devises the means whereby He can come out and reveal Himself to man. The Suitability of Christ to Meet God’s Claims - The substance of the altar was wood and brass and this twofold composition would set forth the perfect humanity and the deity of the Savior. This unique unity gave Him the suitability to meet God’s claims. Remove His deity and His blood cannot atone. Remove His humanity and no blood remains. But this perfect combination enables Him to bear the judgment and shed His blood and so meet the righteous claims of God. The Sufficiency of Christ to Meet Man’s Need - The altar, as to its shape, was foursquare, and this would suggest a universal presentation of the cross-work of Christ. The altar, as to its size, was the largest piece of furniture in the tabernacle. The altar was capable of holding within itself every sacrifice that was commanded to be offered. So Christ, in Himself, by His one sacrifice fulfilled all the offerings, and became the answer to the sinner’s need. The Position of the Altar - The altar was positioned just inside the gate and was easily accessible. It was unavoidable and unmistakable to the approaching Israelite. This was the way of approach to God, and the sinner must come to God by way of the cross. It Teaches the Purity of God - They who minister before the Lord must be clean. The laver warns that no defilement may approach the Lord. Every time the priest entered into the Holy Place, he must wash. Purity of the heart is a necessity for seeing God. “Without holiness no man shall see The Lord.” Washing at the laver was a matter of necessity and not a matter of opinion. It Teaches the Pollution of Man - In the inauguration of the priesthood we learn that the priest was CALLED, then CLEANSED, CLOTHED, and CONSECRATED. The priest on the day of his consecration was brought to the door of the tabernacle and washed all over with water. This washing was performed for the priest by another person. The priest had no hand in it whatsoever, and throughout the entire period of his priesthood this act was never repeated. However, the once cleansed priest could easily defile his hands and his feet. Hands speak of work and feet speak of walk, and we also like the priest in Israel, can become defiled and require cleansing our hands and our feet. The priest approaching the laver would see himself reflected both in the laver and in the water that was in the laver, thus reminding him of the need for daily cleansing. The standard of holiness as seen in the person of Christ and also revealed in the Word, teaches us the need for being clean before the Lord. It Teaches the Provision of Christ - He, who demands purity, provides the purifying stream. The laver would be filled with water that gushed from the smitten rock. The laver then was filled with water and not with blood. The Altar was for the sinner, but the laver was for the priest. It was blood shed and sprinkled at the altar, but water to cleanse at the laver. For priestly sanctuary service the laver was indispensable, and the daily cleansing was needful. Christ revealed that in the Word is the measure of our practical cleansing. “Sanctify them through thy truth; Thy Word is truth” says John 17:17. “That He might sanctify and cleanse it with the washing of the water by The Word” (Ephesians 5:26). “Now ye are clean through the Word which I have spoken unto you” (John 15:3). - The Badger skins - This is termed a covering, presenting Christ as the separate one. “And shod thee with badger skins” (See Ezekiel 16:10). This reference to badger skins sheds light on the meaning of this covering. - Fine twined linen curtains Presenting Christ as the supreme one. Only the priests who functioned in the Holy Place were able to see and admire the beauty of these innermost curtains. The solid structure of the tabernacle was composed of forty-eight boards. Twenty boards formed the North Wall and twenty boards formed the south wall. Six boards formed the west wall, plus two corner boards (or mitered boards). All these boards were made of shittim wood and overlaid with gold. Here again we have a combination of that which speaks of Christ’s humanity and deity with each board expressing the same fundamental truth. Christ is seen in each board and also in the structure as a whole. Christ’s Humanity: Expressed in the Incorruptible Shittim Wood The shittim wood once grew as a tree in the desert, having an earth connection. Christ also grew as a tender plant out of the dry ground. Christ’s Deity: Expressed in the Overlay of Pure Gold Declared to be the Son of God with power, according to the Spirit of Holiness by the resurrection out from among the dead. Each board standing up and overlaid with pure gold sets forth Christ, the eternal Son, in the divine glory and dignity of His person. Redemption: Expressed by the Silver Sockets See Exodus 30:12-16. This silver was the atonement money, so Christ in His resurrection is proof of atonement made and the work completely finished to God’s satisfaction. Christ fulfilled the law toward God and man. Two bars on top – There is a balance Godward. Two bars beneath – There is a balance manward. Continuity of character in the person of Christ. One bar in the midst. This bar extended the whole distance from end to end. Dignity: Expressed by the Rings There were three rings in each board, and since the number three is indicative of heaven and the trinity, we are reminded that “IN HIM” dwelleth all the fullness of the Godhead bodily. The Perpetuity of His Position: The Showbread was always before the face of God. So, Christ in glory is accepted before God in Perpetuity. The Power of His Position: The bread accepted by God became the food of the priests. This bread sustained the priests in their ministry in the sanctuary. So Christ is the food of His people and He is able to sustain them. Worship can only be offered on the basis of an accepted sacrifice. In connection with the service of the priest at the Golden Altar, it is interesting to note the composition of the incense. See Exodus 30:34-38. The time when the priest offered the incense was morning and evening. Every day of the year except one: The Day of Atonement. Also, note the things that prevented a priest from functioning at the altar. See Leviticus 21:16-24. ►The Veil (Exodus 26:31-32, Matthew 27:51, and Hebrews 10:19-20) A number of veils are spoken of in the scriptures, but each one conveys the same idea of that which comes between and hides. There may be differences of judgment in the interpretation of certain parts of the tabernacle or things connected with it, but the spiritual significance of the veil is beyond dispute, because Hebrews 10 makes it clear. [Note: compare this with Hebrews 9:4] The Covering of the Ark is in Exodus 25:17. The cherubim over the Ark, in Exodus 25:18-21, set forth the attributes of God as necessarily characterizing the action of His throne (justice and judgment). Compare Genesis 3:24 with Psalm 39:14. At the mercy seat, justice and judgment have been fully measured out.